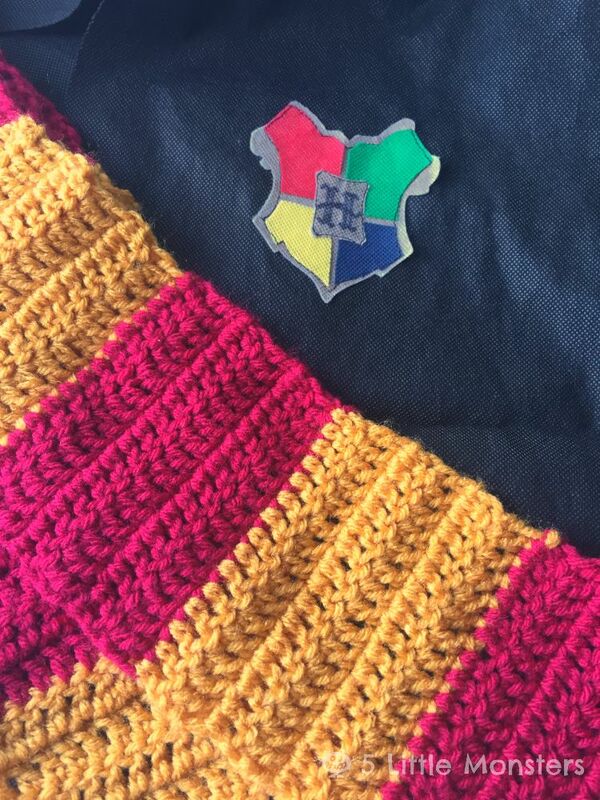 At the beginning of this week I got an email from my daughters teacher explaining that this week was deaf awareness week and they were going to be doing a Harry Potter them all week. On Friday the kids were supposed to dress up as characters from Harry Potter. My daughter was pretty excited and right away decided that she wanted to be Hermione. I started thinking about how I could put together her costume, her brother's white dress shirt, a gray sweater that we happened to have, I could make her a gray skirt really easily. My son's costume was mainly just his church clothes, a white button up shirt and his gray dress pants. We were able to borrow a tie and some glasses from one of the kids cousins who had dressed up as Harry a few years ago so he used those too. I didn't have a tie for Eliza so I made a red and gold scarf for her to wear. Wednesday night Johnny informed me that that he NEEDED a robe and that that robe had to have a hood like Harry's. The bad part about this was that we were bring the kids to Comic Con on Thursday after school and the twins who played Fred and George were going to be there. 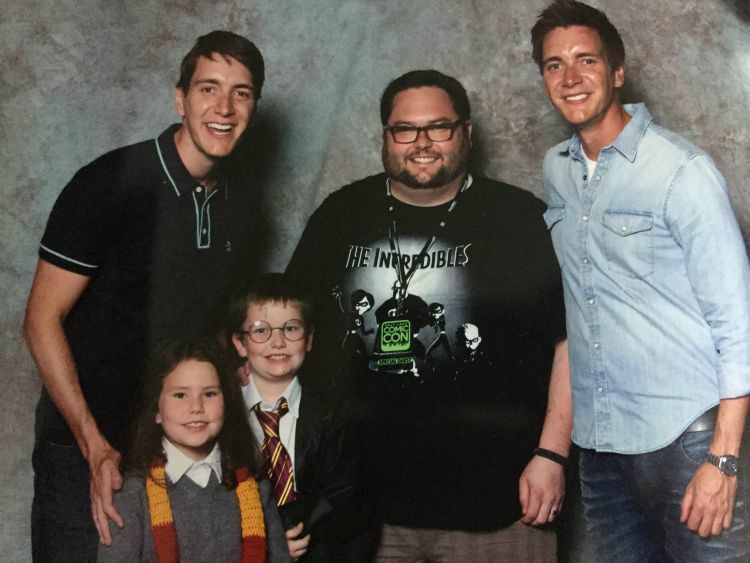 My husband had a discount voucher for a photo op and he decided to use it for the Weasley twins. I thought it would be so fun if we were getting costumes ready anyway, for them to wear them to Comic Con. That meant I had one day to make two robes. Less than one day really. I had seen this 10 minute robe tutorial using black Olyfun but I only had a craft pack size so not even enough for one robe let alone two. I sent my husband off to Walmart to find the cheapest black fabric he could. He texted me saying that they had black Olyfun there so he bought that. They had 5 1/2 yards left so he bought it all. 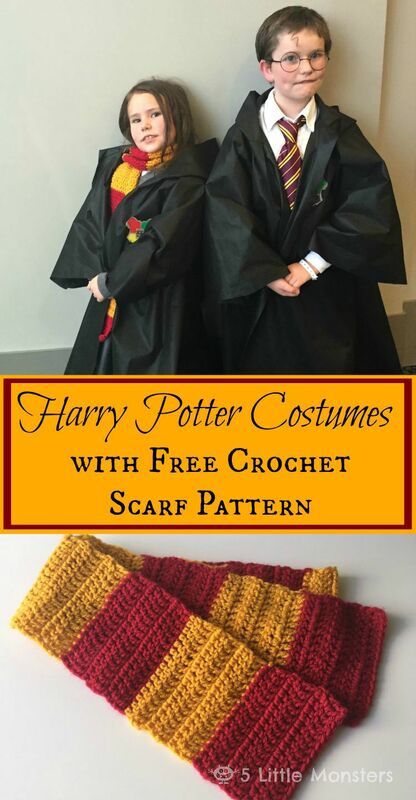 It ended up being the perfect amount for two robes for my kids and it only cost about $8.00. Not bad for two robes, especially when you consider that is the only thing we bought for their costumes. I ended up using this tutorial to make the robes and added a hood. I just cut a rectangle on the fold that was about the same size as the neckline. Cut an angle at the top so that the folded edge was a little higher and sewed that closed. Then I attached it to the neck by first just sewing a normal seam and then flattening the seam and stitching over it with a zigzag just so they wouldn't have a weird seam poking up around the neck. 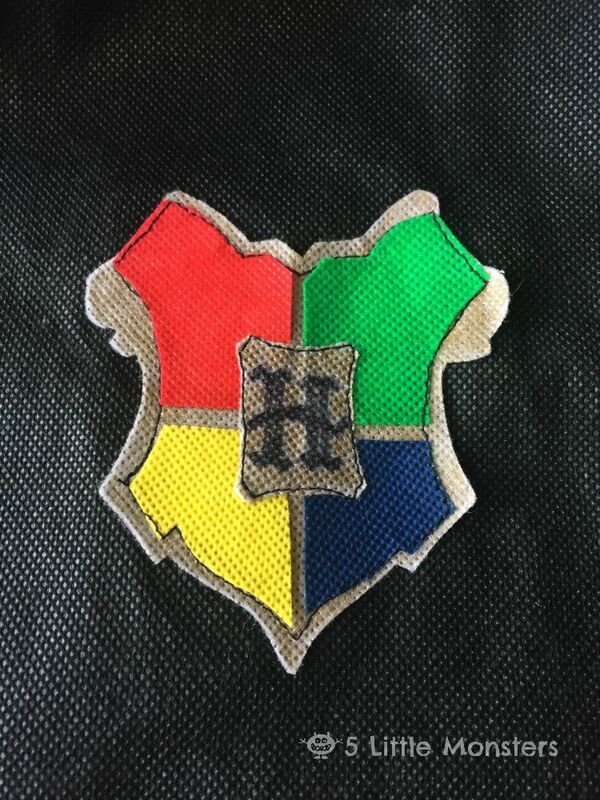 Then using some colored scraps of Olyfun I made a crest. I just glued it together with some tacky glue. For the gold section I used white and colored it with a gold paint pen, then I drew an H with a black sharpie. I quickly sewed that on the chest to finish the robes. 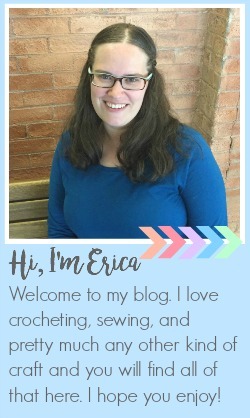 The other part that I made was a scarf. 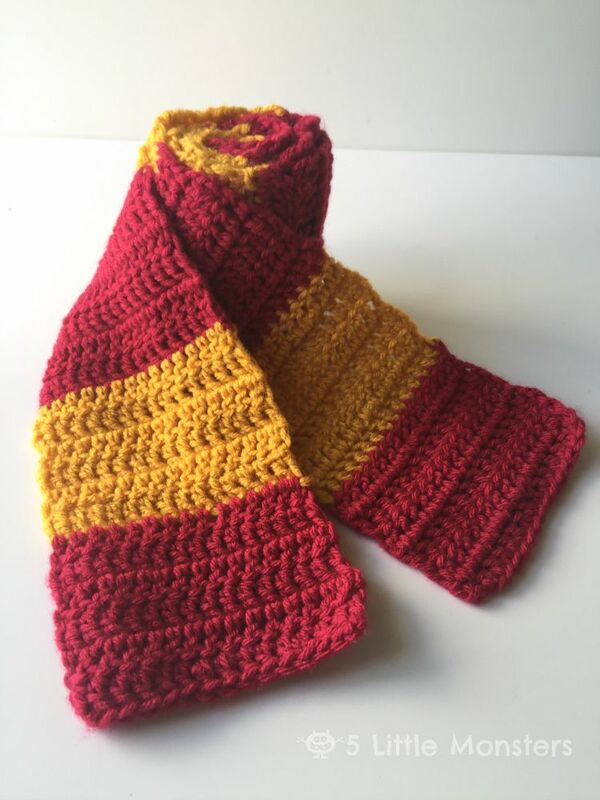 I kid of feel silly posting a pattern for this because it is just a simple dc scarf. I did start my rows a little weird because the thing I really hate about most dc scarves is that the beginning ch 3 on each row leaves an ugly gap and makes the scarf look very homemade. I tried a tutorial for a standing dc and it didn't really work, I could have looked for a different tutorial but instead I just figured out a way that I thought looked better than the ch 3. I just did a ch 1 and then dc in the every stitch, the turning ch did not count as a stitch. I felt like it gave a cleaner edge than the ch 3 for the first stitch method. Because this is just a basic dc scarf you can adjust the width by simply working more dc to make it wider or less to make it thinner. The size of the stripes can also be adjusted by just changing the number of rows in each stripe. This pattern is for the size that I made mine about 5 inches wide, 60 inches long, and each stripe 4 inches tall. Like I said, it is really easy, hardly even a pattern. Easily adjustable to whatever size you need.